With a GranitoGrav on your High-Z or T-Rex CNC machine, you can easily make photo engraving on granite, glass, mirrors, and some metals. Granitograv uses a small brushless spindle with a diamond grinding tool to grind surfaces such as smooth granite and glass surfaces. You will also see great results in Corian and similar materials. By moving the cutter up and down different shades can be achieved and gray scale images can be engraved. 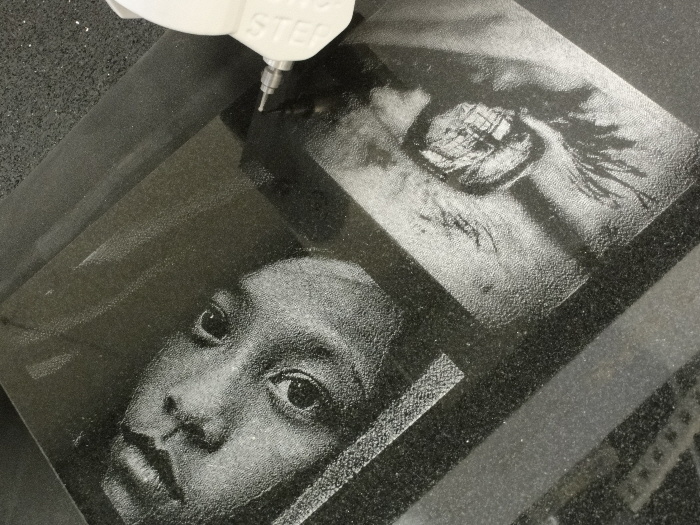 Use the Granitograv to engrave headstones, memorabilia, pet plaques, tiles, glass, mirrors, and metals. Using the module is very easy. Just load a picture - color or black/white - select a few parameters, hit calculate. That's it. No programming skills are required. Compared to laser engravings, Granitograv offers a more hand made, timeless, traditional look. The machine moves swiftly back and forth with small step overs to cover the entire area for engraving. Because of the number of movements, and to ensure efficiency and speed, we always recommend the Turbo models or the T-Rex for this tool. The cost of consumables is low: Grinding bits are about $8 and will last for 3-5 large engravings. Engraving a 300 x 230 mm photo (12" x 9") normally takes 40-50 minutes and a 150 x 100 mm photo (6" x 4") takes 12-15 minutes. For example, a photo of 300 x 230mm requires a processing time of 40-50 minutes. Pictures of 15 × 10 cm are already created in about 12-15 minutes. 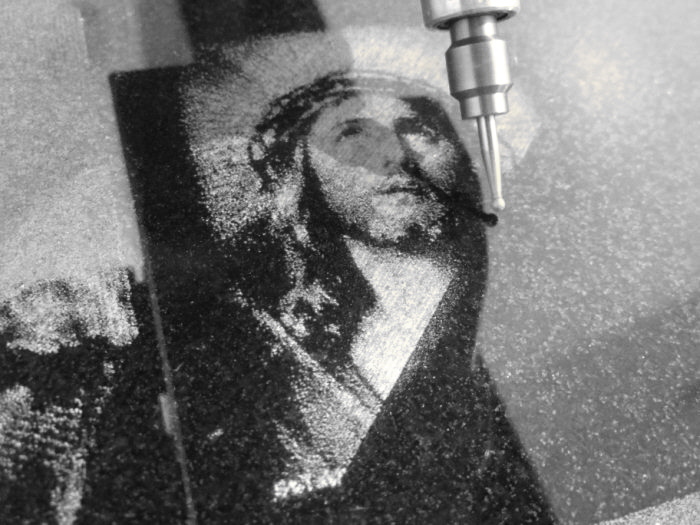 A quick tutorial on using Granitograv for rotary engraving on granite and glass. - Setting the parameters in WinPCNC USB controller software. - Saving the parameters as a template. - Processing an image to generate a toolpath.